The competition in the bar business is cutthroat, and you need a way to stand out just to survive. Your competitors are virtually giving drinks away in order to fill their establishments. They make no money, but they lure your customers away. It’s a lose-lose situation. By the time they go broke, they may have taken you with them. It can often seem as if there is no way to compete. But there is. There is a way to out-compete those unimaginative bar owners who rely on giveaways to fill their bars. There is a way to put your own creativity and imagination to work, and create long term loyalty in the bargain. There is a way to prevail over the competition. The best way to prevail long term is to become an aggressive and creative bar promoter. But there is much to learn. What is a promotion? What is a promoter? “Promote Your Bar” dissects the promotion business and shows you how to get started. You’ll learn to embrace the promotion mindset and how to develop your own promotion philosophy. Your competitors will wonder what hit them. They won’t understand how you can be busy when they’re giving the house away. They’ll fail to realize the public would much rather pay full price to be in a quality, happening place rather than a boring place with cheap drinks. The bar going public is desperate for something to buy into. They want to be entertained. You can be the one to do it or stand by and let someone else do it. It will be done either way, so why not you? A continuous series of well-planned, well-executed promotions can make you the dominant player in your market, and give you that all-important buzz. Give your customers a positive reason to come to your bar, rather than mere giveaways. “Promote Your Bar” is designed especially for the beginning bar owner, and can be invaluable in learning how to win in the bar business. 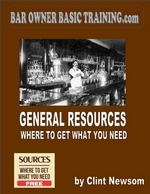 Click on one of the links below to order the copy that best works for you Promote Your Bar.